This post originally appeared on the International Food Policy Research Institute's (IFPRI) blog and was written by Agnes Quisumbing, a Senior Research Fellow in IFPRI's Poverty, Health, and Nutrition Division (PHND) and theme leader of the institute’s cross-cutting theme on gender. We agree, and IFPRI is committed to fixing this problem. This phenomenon is insidious. It’s as if when one thinks of a woman, one only thinks of a housewife who takes care of children—not a farmer, entrepreneur, problem-solver or innovator. How many husbands say “my wife doesn’t work” because her unpaid work is effectively invisible? IFPRI’s work focuses on supplying some of this missing data and making sure it covers women and girls in all their roles. With better data, we can understand the struggles women (and men) face and ultimately implement programs that address those constraints. IFPRI has been working on this issue for three decades. In the 1990s, for example, it undertook a project that collected information on the assets that men and women own, exploring how those affect bargaining power within households. In 2012, we worked with the Oxford Poverty and Human Development Initiative and USAID to develop the Women’s Empowerment in Agriculture Index (WEAI). The WEAI was groundbreaking because it deliberately asked about a woman’s decision-making roles in production, her control over productive resources, her control over income, and her leadership roles in the community—as well as how many hours she worked over the course of the day, including both work for pay or to earn a living and work such as minding children and the elderly, cooking, and fetching wood and water. This allowed us to assess how empowered she was across five key domains of empowerment: Production, resources, income, leadership and time. Notably, the WEAI also asked the same questions about the man in each household, so that their empowerment scores could be compared. The baseline report from 13 countries showed that women are disempowered with respect to access to and decisions on credit, workload and membership in community groups. As of December 2018, 86 organizations in 52 countries worldwide have used the WEAI to gather and analyze such data. Yet there continues to be a demand for a standardized and validated measure of women’s empowerment that development projects can use to assess their impact in this area, particularly within the typical two- to five-year project cycle. This need is especially acute for projects whose specific goals include empowering women, not just reaching and benefiting them. Projects must also anticipate potential unintended negative consequences that could result from women’s participation. These include backlash from men against efforts to specifically target and/or empower women and increased constraints on women’s time that may, in turn, negatively affect their own and their children’s health and nutrition. The Gender, Agriculture, and Assets Project, Phase 2 (GAAP2), supported by the Bill & Melinda Gates Foundation, USAID and the CGIAR Research Program on Agriculture for Nutrition and Health (A4NH), is working to bridge the gender data gap to see how agricultural development projects reach, benefit and empower women. GAAP2 is working with 13 projects to develop and test a project-level measure of women’s empowerment, the pro-WEAI. When we began this work, we asked project leaders what aspects of empowerment were important to success and how to measure each. They suggested questions on mobility, intimate partner violence and whether the intervention affected intrahousehold harmony. Drawing on these recommendations, the draft pro-WEAI, recently piloted by the participating projects, builds on the WEAI methodology and includes 12 indicators of women’s empowerment in agriculture: autonomy in income, self-efficacy, attitudes about domestic violence, respect among household members, visiting important locations, work balance, access to and decisions on financial services, control over use of income, ownership of land and other assets, input into productive decisions, group membership and membership in influential groups. Each indicator is organized within a domain: intrinsic agency (power within), instrumental agency (power to) and collective agency (power with). Over the next two years, participating projects will use pro-WEAI in endline surveys to examine their impact on women’s empowerment and other development outcomes. To ensure we measure type of agency correctly, we are also working with colleagues from Emory University to validate pro-WEAI using psychometric methods. Data doesn’t just mean numbers. What’s different about the pro-WEAI methodology is that it’s not only based on quantitative surveys but also on qualitative work that reflects the individual voices of women and men. This work shows that women and men perceive empowerment in many ways and the varied terms communities use to describe empowered women (e.g., “independent,” “autonomous,” “emancipated,” “respected”), highlight the challenge of translating the concept across cultural contexts. Another important lesson from this qualitative work: While one can compare a numerical score across countries and contexts, this number may still not reflect women’s own sense of empowerment—if they are perceived poorly or socially sanctioned for having the very qualities, abilities and opportunities on which their high score is based. Our qualitative work shows that it is important to consider synergies and trade-offs between different empowerment indicators. For instance, strategies to enhance women’s incomes may change the distribution of financial and labor responsibilities, as well as intrahousehold dynamics. 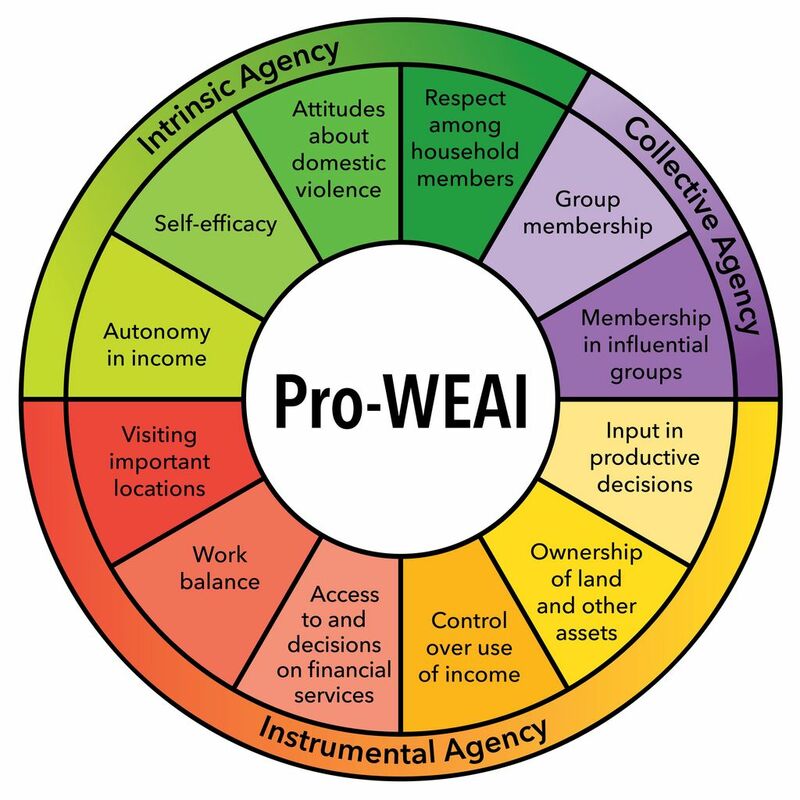 Pro-WEAI scores must be considered not only in terms of individual indicators but also in relation to one another to acknowledge and assess these potential complementarities and tensions. Our work shows that conducting qualitative research alongside calculating the numerical pro-WEAI score allows us to better interpret results and ultimately improve interventions. Bringing quantitative and qualitative methods together offers a valuable opportunity to explore quantitative trends and patterns in women’s empowerment while engaging with the messy complexity and shifting meanings of empowerment for women and men in specific times and places.